In the previous article titled When Normal Fasting Blood Glucose Results Aren’t Necessarily “Fine” I explained why normal results on a fasting blood glucose (FBG) test does not necessarily mean that a person is not at risk for Type 2 Diabetes, as well as other metabolic diseases. Even when both fasting blood glucose and 2-hour Oral Glucose Tolerance Test levels are normal, the person can still have a very abnormal blood sugar response after they eat. In addition, as mentioned in the previous article, this won’t necessarily show up on a HbA1C test (3-month blood sugar average) because blood glucose returns to normal within 2 hours. An even bigger concern than these ‘spikes’ of high blood glucose are the chronically high levels of the hormone insulin, a condition called hyperinsulinemia. Hyperinsulinemia occurs because a person’s blood sugar spikes every time they eats carbohydrate-based foods due to one of the roles of insulin being to take excess sugar out of the blood and move it into the cells. Even though blood glucose returns back to normal by 2 hours after eating carbohydrate (in response to the effect of the hormone insulin) this abnormal glucose response to eating carbohydrate-based foods is what drives hyperinsulinemia and is made worse by insulin resistance, which I explain below. I call this overall response “Carbohydrate Intolerance” because like other food intolerances such lactose intolerance or gluten intolerance, the body is clearly not able to handle large amounts of carbohydrate and remain healthy. It is the hyperinsulinemia and not the high levels of blood sugar in and by itself that puts people at risk for the serious chronic diseases of cardiovascular disease (heart attack and stroke), high cholesterol and high blood pressure  that people usually associate with Type 2 Diabetes. High blood sugar does have risks of course, including loss of vision and amputation of limbs, but to use and analogy, if high blood sugar is the “tip of the iceberg” then hyperinsulinemia is the bigger part of the iceberg that can’t be seen. We can’t see it because it is rarely, if ever measured. Most concerning is that based on the same large-scale 2016 study referred to in the previous post  which looked at the blood glucose response and circulating insulin responses from almost 4000 men aged 20 years and older and 3800 women aged 45 years or older during a 5 hour Oral Glucose Tolerance Test. The study found that 53% had normal glucose tolerance; that is, they had normal fasting blood sugar and did not have impaired glucose tolerance (IGT) 2 hours after the glucose load. Of these people with normal glucose tolerance, 75% had abnormal blood sugar results between 30 minutes and 1 hour. In the previous article, I illustrated what the three abnormal glucose responses looked like compare to a normal glucose response. 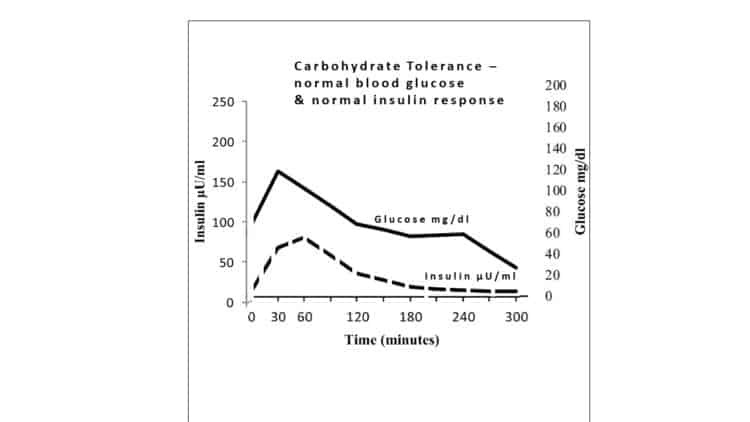 A normal blood glucose curve represents Carbohydrate Tolerance and for all intents and purposes, the three abnormal glucose response graphs represent the Three Stages of Carbohydrate Intolerance; Early Carbohydrate Intolerance, Advanced Carbohydrate Intolerance and Severe Carbohydrate Intolerance. As outlined in the previous article, the normal blood glucose curve rises to a single moderate peak and then decreases steadily until it’s back to where it started from at 2 hours. Carbohydrate Intolerance occurs in three progressive stages, Early Carbohydrate Intolerance, Advanced Carbohydrate Intolerance and Severe Carbohydrate Intolerance and culminates with the diagnosis of Type 2 Diabetes (T2D). Hyperinsulinemia combined with insulin resistance form the heart of Carbohydrate Intolerance. In the early stages of Carbohydrate Intolerance, receptors in the liver and muscle cells begin to stop responding properly to insulin’s signal. This is called insulin resistance. Insulin resistance can be compared to someone hearing a noise such as their neighbour playing music, but after a while their brain “tunes out” the noise. Even if the neighbour gradually turns up the volume of the music, the person’s brain compensates by further tuning out the increased noise. This is what happens with the body when it becomes insulin resistant. It no longer responds to insulin’s signal. To compensate for insulin resistance, the β-cells of the pancreas begin producing and releasing more and more insulin resulting in hyperinsulinemia, which is too much insulin in the blood. Hyperinsulinemia along with insulin resistance form the heart of Carbohydrate Intolerance. In Early Carbohydrate Intolerance rather than blood glucose going up to a moderate peak and then falling gradually, blood sugar begins to remain elevated at 60 minutes before beginning to drop. Blood sugar at fasting is normal and after 2 hours did not return to baseline, but did not meet the criteria for impaired glucose tolerance. A two-stage rise in glucose can be clearly seen. As the inability to tolerate carbohydrate progresses, the Advanced Carbohydrate Intolerance curve (below) reflects that blood sugar goes slightly higher at 60 minutes than at 30 minutes before beginning to fall, yet these people still have normal blood glucose at fasting (baseline) and do not meet the criteria for impaired glucose tolerance at 2 hours. As you will see below in the section about insulin, this is where insulin release is already very abnormal. 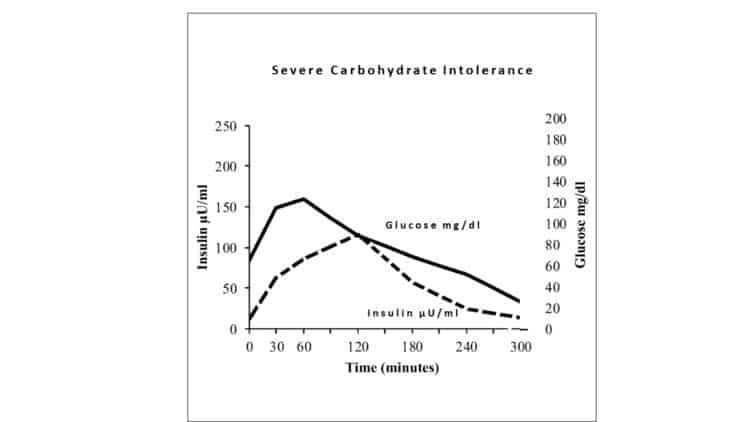 While the Severe Carbohydrate Intolerance curve (below) is shaped only a slightly differently than the Advanced Carbohydrate Intolerance curve (above) as you will also see further on in this article, the insulin response in both of these two curves is very different. The β-cells of the pancreas of healthy people are constantly making insulin and storing most of it until these cells receive the signal that food containing carbohydrate has been eaten. β-cells also constantly release small amounts of insulin in very small pulses called basal insulin. This basal insulin allows the body to use blood sugar for energy even when the person hasn’t eaten for several hours or longer. The remainder of the insulin stored in the β-cells is only released when blood sugar rises after the person eats foods containing carbohydrate and this insulin is released in two phases; the first-phase insulin response occurs as soon as the person begins to eat and peaks within 30 minutes and can be seen at 30 minutes on the graph below. The amount of the first-phase insulin release is based on how much insulin the body is used to needing each time the person eats. Provided a carbohydrate tolerant person eats approximately the same amount of carbohydrate-based food at each meal day to day, the amount of insulin in the first-phase insulin response will be enough to move the excess glucose from the food into the cells, returning blood sugar to its normal range of ~100 mg/dl (5.5 mmol/L). If there is not enough insulin in the first-phase insulin response, the β-cells will release a smaller amount of insulin within an hour to an hour and a half after the person began to eat. 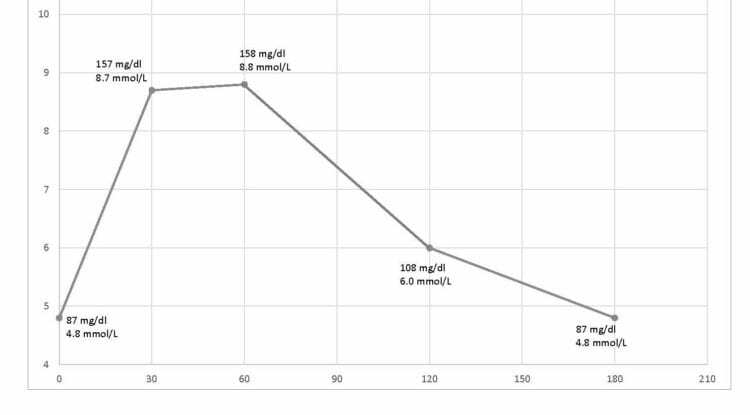 This is the second-phase insulin response and can be seen at 60 minutes on the graph below. Below is the same normal glucose curve as above but here it is unlabeled and it is show along with the corresponding normal insulin curve (dashed line). As one can see, the two responses are more or less proportional to each other. As glucose rises in the blood, insulin is released mainly as a first-phase insulin response, which results in the blood glucose level falling in a straight line to baseline by 2 hours. 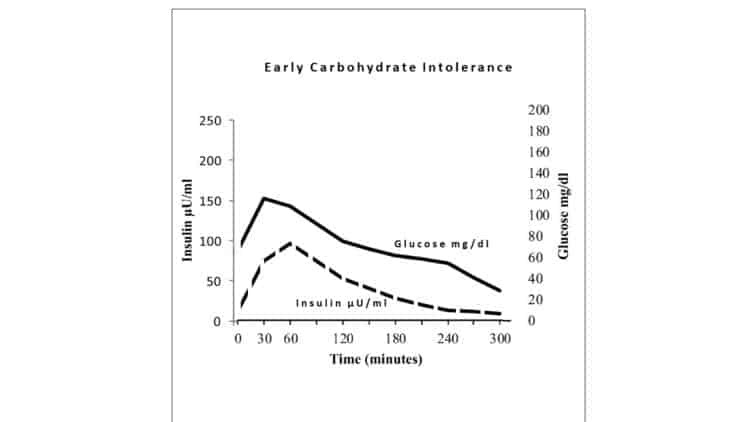 Below is the same Early Carbohydrate Intolerance glucose curve as above and in the previous article, just unlabeled. As one can see, as glucose rises in the blood even more insulin is released; initially as a first-phase insulin release and then as a second-phase insulin release. 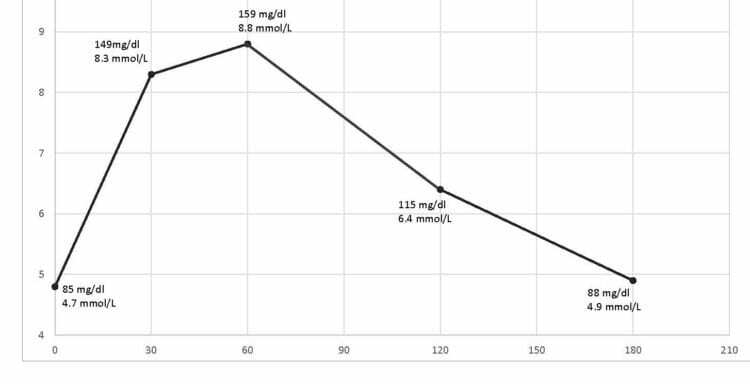 This results in blood glucose level falling but not to baseline (fasting levels) by 2 hours afterwards, but the fall is not as a straight line. There are clearly two peaks in the glucose curve, before it falls. With ongoing high intake of carbohydrate every few hours, especially refined and processed carbohydrate such as bread, pasta and rice which are broken down quickly to glucose, the amount of insulin that must be released from the β-cells of the pancreas to handle a steady intake of carbohydrate-based foods increases substantially. 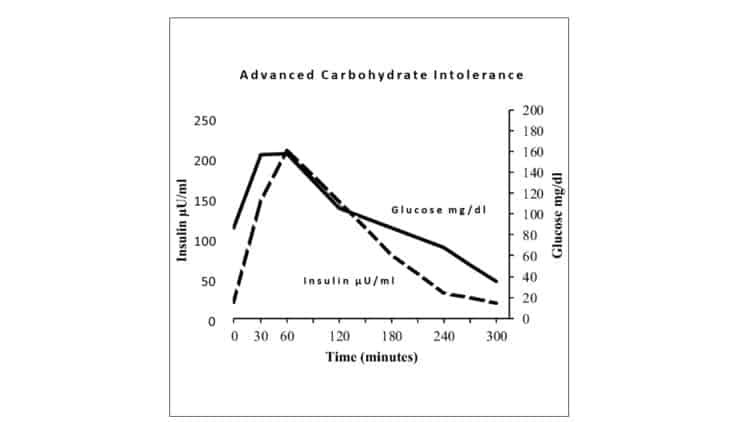 The dashed black line on the graph below shows the insulin curve of Advanced Carbohydrate Intolerance. While the Early Carbohydrate Intolerance glucose curve doesn’t look significantly different then the Advanced Carbohydrate Intolerance curve (see above), it’s easy to see that the insulin curves are VERY different! The hyperinsulinemia (high levels of insulin) that is present in Advanced Carbohydrate Intolerance is easy to see. Most concerning is that 53% had normal glucose tolerance (i.e. normal fasting blood sugar and 2 hour postprandial blood sugar <7.8 mmol/L). Of these people with normal glucose tolerance, 75% had abnormal blood sugar results between 30 minutes and 1 hour and the chronically high levels of insulin that accompanies it put these people at significant risk of chronic diseases in addition to Type 2 Diabetes, including heart attack and stroke, hypertension (high blood pressure), elevated cholesterol and triglycerides, non-alcoholic fatty liver (NAFLD), Poly Cystic Ovarian Syndrome (PCOS), Alzheimer’s disease and other forms of dementia, as well as certain forms of cancer including breast and colon cancer . Standard tests for blood glucose will NOT show the significant abnormality in Advanced Carbohydrate Intolerance in terms of how the body is able (or rather, not able) to process carbohydrate between 30 minutes and 60 minutes because standard blood tests do not test either glucose or insulin at these points! It’s not that there aren’t abnormalities, it is just that they are not measured! 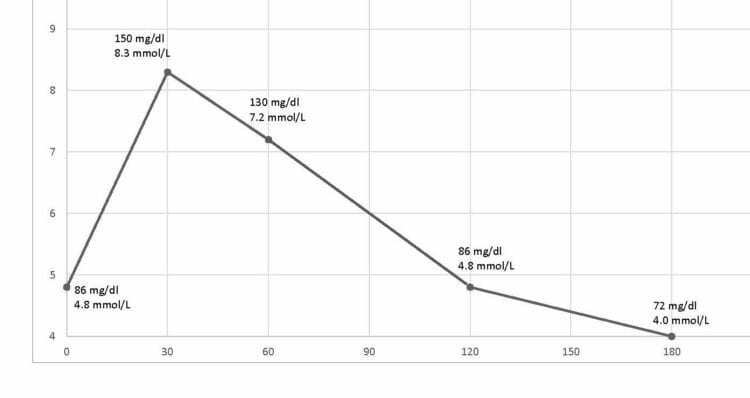 By the time people’s insulin and glucose curves look like the ones below, these people have no way of knowing they are at significant risk for the serious, chronic diseases listed above because their fasting blood sugar is still normal! Type 2 Diabetes (T2D) is the final stage of Carbohydrate Intolerance and is the natural outcome of a person continuing to eat a diet high in carbohydrate-containing foods at each of their meals and at snacks when their body is unable to tolerate it, which is made worse by insulin resistance. Often this is the natural outcome of people following Dietary Guidelines (US or Canadian, which are quite similar) which are designed for a healthy population not people who are metabolically unwell. The problem is most people think they are healthy because they have normal blood glucose tests, and their metabolic dysfunction is never measured! The Dietary Guidelines recommend that people eat 45-65% of their dietary intake as carbohydrate, which people in both countries do and even those who limit grain-based carbohydrate often take in considerable amounts of carbohydrate in the form of fruit, milk and yogurt, as well as starchy vegetables such as peas, corn and potatoes which puts the same strain on their β-cells as the “carbs” they are not eating as grain. Since ~75% of people with normal glucose tolerance have abnormal blood sugar results between 30 and 60 minutes as well as the accompanying abnormal insulin levels, these people continue to put a very high demand on their pancreas to produce and release large amounts of insulin every few hours when they eat, until it’s too late. Diagnosing hyperinsulinemia is simple and can be done with existing standard lab tests; namely a 2 hour Oral Glucose Tolerance test with an extra glucose assessor and extra insulin assessor at 30 minutes and 60 minutes. When patients request this test because they are at high risk, too many are told that it is “a waste of healthcare dollars” when quite literally they could be spared the scourge of Type 2 Diabetes by having the changes in insulin and glucose response diagnosed in the decade before blood sugar begins to become abnormal! It’s time to think about ways to implement dietary changes and lab testing procedures that will keep people from becoming Carbohydrate Intolerant and from developing hyperinsulinemia, Type 2 Diabetes and the host of metabolic diseases that go along with it.